This is a list of posts tagged with Fable. As Ed noted earlier this evening after his post within a comment on my Perfect Dark Zero review, Mook is now in the Xbox 360 fold. Well, if there was a game made for him — besides Katamari Damacy of course — then this one is it. 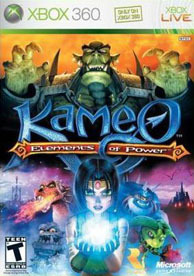 Kameo: Elements of Power is actually the game I have enjoyed the most to date. So, the indictment of Mook may also be one of myself. D’oh! Well, at least this game is about a cute little elf girl instead of a King and his package.